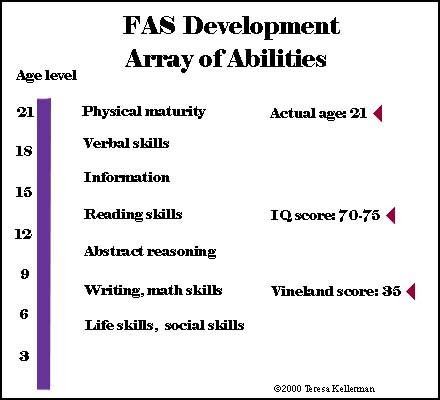 These different levels of development occur in one individual at the age of 21. The person has Fetal Alcohol Syndrome. These are actual results from a psychological evaluation that measures IQ, functional abilities, and adaptive behavior skills. IQ score is about 70. Vineland (adaptive behavior scale) score is about 35. The person has good expressive language skills, which others use to judge intellectual abilities. But the person's ability to function successfully in life is far below what is expected, based on appearances only. Teachers, law enforcement officials, and even parents may have higher expectations of the individual with FAS or ARND than the person can actually achieve. The greatest obstacle individuals with FAS/ARND have to overcome is the chronic frustration that results from the unreasonable expectations of others. This may contribute to the leading secondary condition associated with FAS related disabilities: clinical depression with thoughts of suicide. Early recognition and understanding of FAS/ARND can help prevent the serious secondary effects associated with FAS.